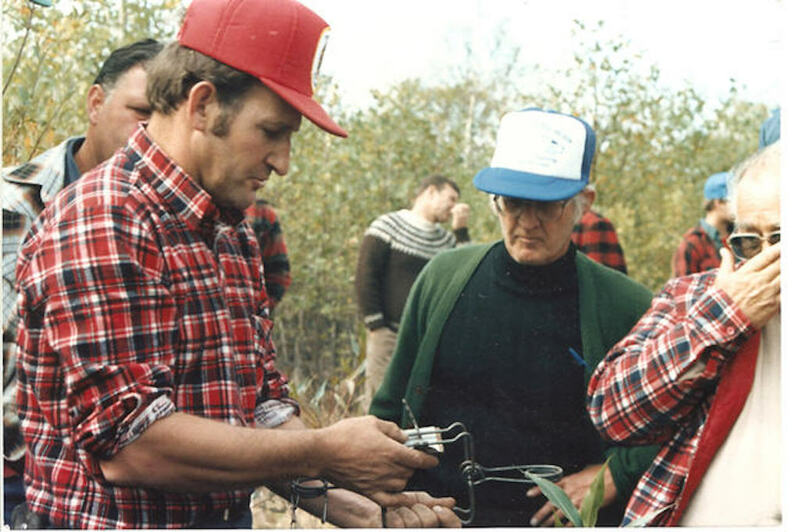 Alcide Giroux (1945-2018), known to his friends as “Ti Loup”, demonstrates a small Conibear trap for marten to war veteran Roland Giroux (not related) at a trapping workshop in 1986. Alcide’s life as a trapper began in 1951, near Sturgeon Falls, Ontario, when he was just six years old. His family had moved into the old homestead his grandfather built in the 1920s. There was no electricity or indoor plumbing, and Alcide and his siblings had to cross the Sturgeon River in a homemade boat before walking to school – a walk that provided opportunities for the young Alcide to snare rabbits to complement the moose and beaver in his mother’s stew pot. It was God’s Country back then, he later recalled, with wilderness and wildlife all around. Their trap lines began at the farmhouse door. Alcide went on to become one of Canada’s foremost advocates for humane trapping. By the time he was 30, in 1975, he was writing articles in trappers’ magazines and leading workshops across Ontario and beyond, promoting the importance of researching and implementing better trapping techniques. In 1980, as newly-elected president of the Ontario Trappers Association, he called on trappers to take the lead in humane trapping, rather than have changes imposed on them by others. When the Fur Institute of Canada was created in 1982, to implement recommendations of the Federal-Provincial Committee on Humane Trapping (1974-81), Alcide became a founding member, and later vice-chair. He travelled the world to lend his expertise to trap-research and conservation meetings in New Zealand, Europe, Louisiana, Australia and elsewhere. When scientists, politicians or journalists wanted to see a trap line first-hand, more often than not it was Alcide and his wife Pat who received them. In recognition of Alcide’s outstanding contributions, in May 2005 he was presented with the Fur Council of Canada’s “Furrier of the Year” award, at the North American Fur & Fashion Exposition in Montreal (NAFFEM). In his speech to more than 600 fur manufacturers, designers, retailers and government officials, Alcide reminded them that trappers did more than provide beautiful furs. They were also front-line defenders of the industry, using responsible practices and educating the urban population – including furriers – about the importance of using nature’s gifts sustainably. Alcide Giroux: My first 60 years enjoying nature as a trapper. By Alan Herscovici, June 30, 2016.